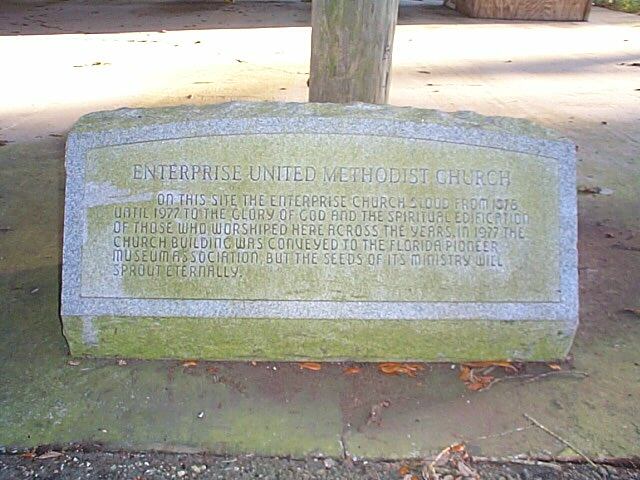 ENTERPRISE UNITED METHODIST CHURCH HISTORICAL MARKER. A photograph of the church in its present location is included at http://www.pioneerfloridamuseum.org/buildings/enterprise/enterprise.html. The cemetery includes headstones indicating at least seven burials before 1900, the earliest of which was in 1891. Instructions to reach this location are as follows: From the intersection of Clinton Avenue (County Road Alternate 52) and US Highway 301 south of Dade City, travel east on Clinton Avenue 1.4 miles. Cross Old Lakeland Highway (CR-Alt 35), and Clinton Avenue becomes Enterprise Road. Continue approximately 0.9 miles to the cemetery on the south side of the road at the top of a slight rise. Prominently visible in this approach is a white gazebo located on private property immediately before the cemetery. Visitors to this cemetery might wish to assess their personal comfort level with a large Chow dog, a brindle Boxer, and a black-and-white American Pit Bull Terrier that live across the road and regularly patrol the area. A recent visitor reported the dogs showed no sign of aggression.